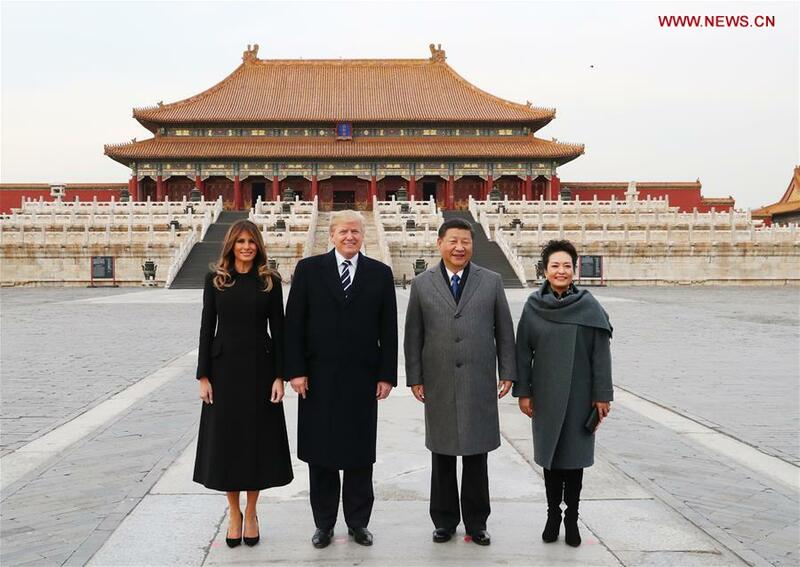 BEIJING, Nov. 8 (Xinhua) -- Chinese President Xi Jinping and his wife Peng Liyuan invited U.S. President Donald Trump and his wife Melania Trump to the Palace Museum, also known as the Forbidden City, after the U.S. president started his state visit to China in Beijing Wednesday. They walked along the museum's central axis, also the axial line of Beijing, and visited Taihedian, Zhonghedian and Baohedian, three main halls of the Forbidden City. During the tour of the ancient palace, Xi briefed the visiting couple on the museum's history, architecture and culture, which received high praise from them. Baohedian, the Hall of Preserving Harmony, served as the wedding venue for Emperor Shunzhi of Qing Dynasty. At every Chinese New Year's Eve and on the fifteenth day of the first month on the lunar calendar, emperors held banquets here to entertain vassals, imperial kinsmen and high-ranking ministers.